"Grounded in Scripture; Spoken in Love"
This summer I’ve had the pleasure of witnessing the nuptials of two nieces, one in Colorado and the other in California. And, thanks to both couples, I have memories that I will treasure for the rest of my life. My niece Jenny is one of the most genuine people you could ever meet. She is happy, confident, loves nature, and welcomes everybody with arms open wide. Evan is a very talented musician. I admire anybody who can play the guitar and draw you into a song by the way he interprets and presents the lyrics, and Evan is one of those musicians. Jenny and Evan exchanging their vows. Jenny and Evan enjoy the music scene in Grand Junction, Colorado. They also enjoy rafting, hiking and camping in the many beautiful areas of the western slope in Colorado. They are blessed with a tight group of friends, referred to as their “Friend Family” who are as genuine inside and out as are Jenny and Evan. Consistent with their love of music and the mountains, Jenny & Evan selected Ridgway State Park in western Colorado as the venue for their lovely wedding. 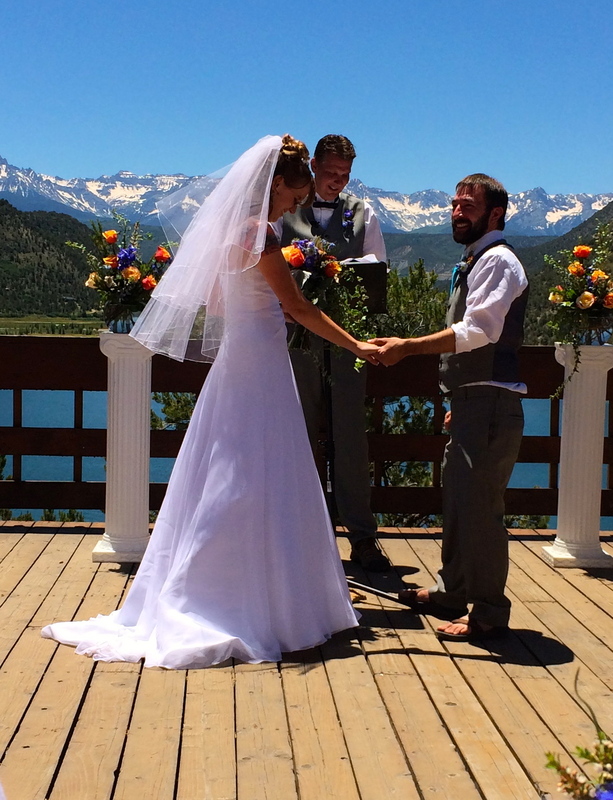 The nuptials themselves were celebrated at the Visitor Center Overlook – a beautiful spot overlooking the Ridgway Reservoir. As we walked down the short trail from the parking area to the overlook it was easy to see why they love this place so much, for the view was simply breathtaking. Visitor Center Overlook at Ridgway State Park. Site of Jenny and Evan’s nuptials. The Head Table ready for the bridal party. The reception was also at Ridgway, in a pavilion in the Pa-Co-Chu-Puk area of the park. Offering a 360 degree panoramic view of the western Rockies, we all relaxed and enjoyed the celebration. Given their involvement in the Grand Junction music scene, many of the Friend Family brought their instruments – we had guitars, a mandolin, a banjo, drums…you name it they brought it. All of us enjoyed some of the best musicians from the Grand Junction music scene taking the stage and jamming together; it was an experience that this music lover enjoyed immensely. It was one of those nights that, for me anyway, ended much too quickly. The reception featured several talented musicians from Grand Junction jamming together on stage. One of the cooler aspects of weddings: seeing relatives we haven’t seen in a long time. Here I am with my aunt and uncle from California. My niece Bailey is a lovely woman of faith. Her tastes tend toward simple and sophisticated. She has a heart for those less fortunate and her smile lights up the room. Bailey met Brett as they both worked for the Daily Skiff student newspaper at Texas Christian University. They met some six-plus years ago. Brett impresses me as a genuinely kind and caring man, absolutely perfect for my niece. I liked him immediately upon meeting him a few years ago, even though he beat the snot out of me in Laser Tag! Brett is a native of Pasadena, California and upon graduating from TCU Bailey followed him out there. 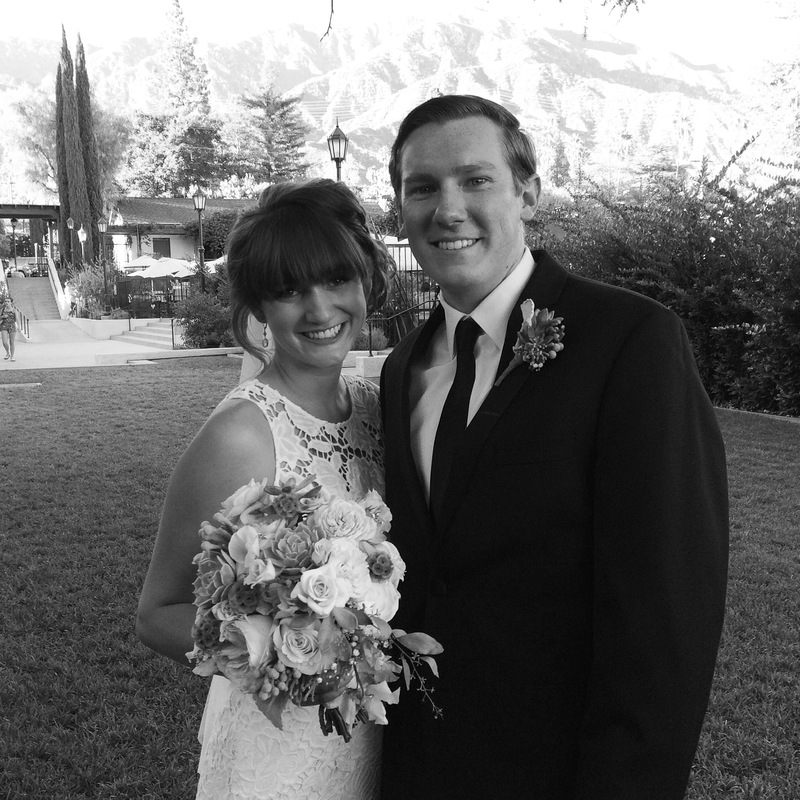 Bailey has adopted Pasadena as her home, and as such, having her wedding there was the logical choice. The venue was the beautiful Altadena Country Club, where I understand Brett’s parents are long-time members. The wedding ceremony took place on a beautiful lawn enclosed by large, perfectly groomed hedges. The bridesmaids and the bride herself entered from a landing above us, then descended the stairs to their waiting guests. The ceremony itself was beautifully Christian. The pastor talked about how the joining of a man and a woman in holy matrimony is akin to Christ offering Himself to his beloved creation – in essence His bride, the church. The reception featured a DJ – one of the best I’ve heard in a long time – a nice sit-down dinner and an open bar. During dinner the DJ spun classics by such greats as Frank Sinatra. After dinner many of us enjoyed cigars on the veranda as the DJ spun current era dance tunes. Yours truly, along with several others of us older folks, shared the dance floor with Bailey & Brett and their friends and had a marvelous time dancing to the beat. Of course, it didn’t hurt in my mind that I was burning calories at the same time! The pastor at Bailey & Brett’s wedding reminded us that Jesus Himself enjoyed weddings. In fact, it was at a wedding that Jesus performed His first miracle as he turned several jugs of water into the finest of wines. I enjoy weddings, too. Weddings are an object lesson in love. 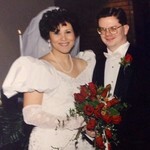 Every time I attend a wedding I remember the day I married my lovely wife. I remember my sisters’ weddings and how I was one of the young people breaking a sweat as I broke moves on the dance floor. This summer, at Jenny and Bailey’s weddings, I enjoyed being one of the adults. I enjoyed watching my nieces, their new husbands and their friends celebrating love and friendship. I enjoyed meeting Evan’s and Brett’s friends and family who are now part of my family – what a gift! I not only enjoy my memories and the day at hand, but I look ahead to the weddings of my daughter and my son. Yes, someday it will be DeLisa’s and my turn. At Bailey & Brett’s rehearsal dinner, Brett’s mom Cathy told us that she had been praying for Bailey since the day Brett was born. I, too, lift up the young man and young woman who will one day join with my daughter and my son as life partners though holy matrimony. Of course, no rush!